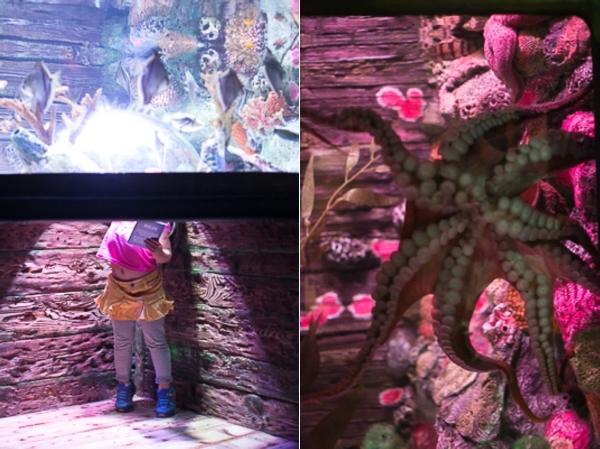 With my sabbatical from work in full force, I decided to take one Friday as a fun day with our girls last week – one of the stops on our Friday Funday involved a stop at Sea Life down in Crown Center (which is right next to Legoland, my review here). 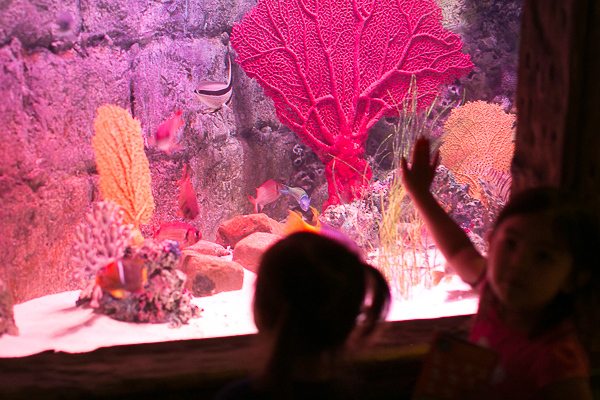 The last time we visited Sea Life was during the holidays in 2013, when they were both still a wee bit young (but the benefit was that 2 and under are FREE). It was really cool going during the holidays because Santa is swimming in the aquariums! 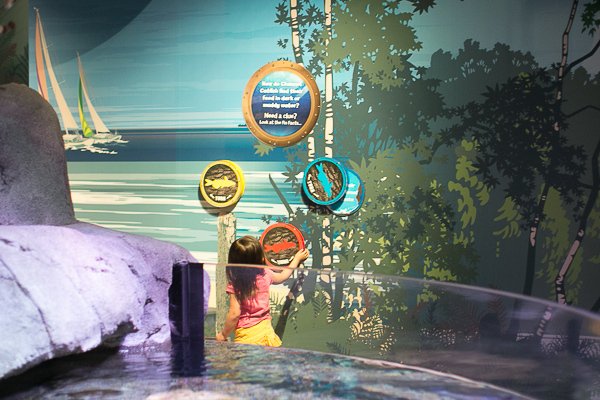 Whether your kids are young or old or if you are an adult wanting to go see some natural wonders of sea life, I would highly recommend making a point to visit the exhibit. Before going, I would suggest buying your tickets online prior to going so you can get the tickets at a discounted price. 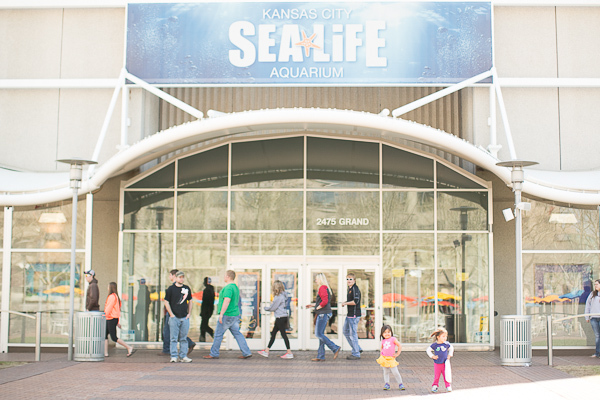 Plan on around an hour and a half to two hours touring this awesome Kansas City attraction. When you wait in line for the tickets (I would suggest buying them online so you can get them at a discounted price). While you are waiting to get in and/or buy tickets, they have an awesome little aquarium out front that will occupy your kids until you can grab your tickets. We went on a Friday, so we waited in line for about a minute, if that. However, during the holidays, you can expect a longer wait (I recall having to distract the girls while I had Ryan wait in line to get tickets). The host then leads you to a room where you take fun and goofy photos that you can view at the end of the tour. For the kids, they provide a book that you can use with the kids to go around and “emboss” each page for every station. At the end, they show their completed stations to the Sea Life ambassador, and they get a medal necklace. Pretty cool. After taking your photos, they lead you into this AMAZING room. This was by far one of my favorite rooms at Sea Life because it was super dark and you could see the amazing glow of the fish. 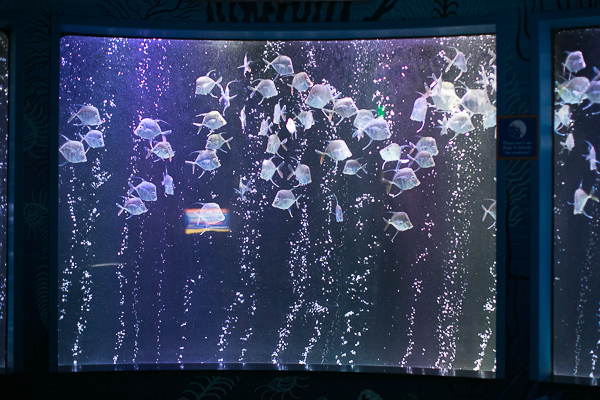 After moving away from this room, you are greeted in the next room by bright coral and another huge aquarium. 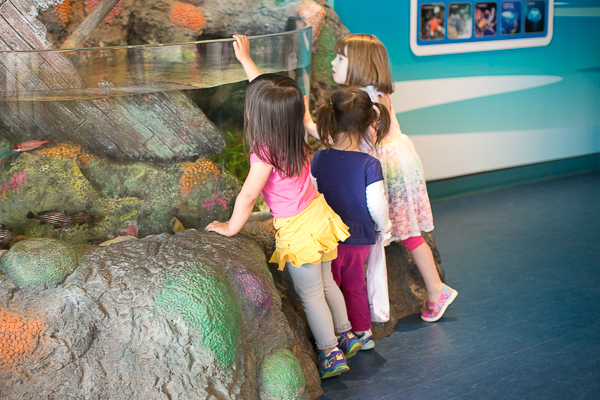 You’ll also find awesome facts about the ocean and sea life scattered throughout the exhibit where kids are encourage to explore. 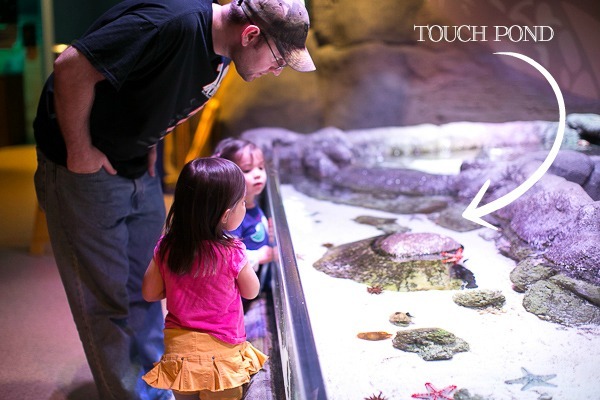 In the first few stops, you get to the “touch” area where kids can touch all sorts of things. If I recall correctly, there were starfish, snails, and other sea life. My kids did not want anything to do with it. Sigh. There’s also an Octonauts exhibit that they just put in, which the kids enjoyed! I felt like the exhibit was pretty lengthy, I recall the bathrooms were right next to the touch pond. However, my kids needed to go potty near the very end, so we had to go through about 4 loops to get to the bathroom. 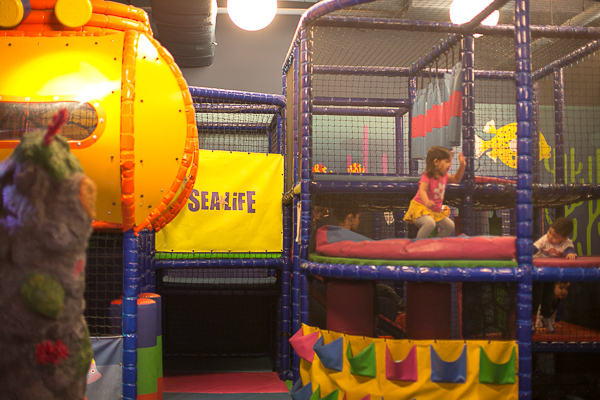 Near the end of the exhibit, they put a play area for the kids to run around. Obviously, my kids loved it! it wore them out for the drive home. 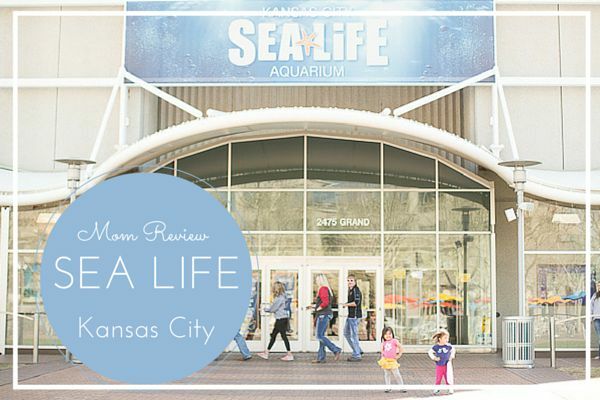 I would definitely recommend going to Sea Life in Kansas City with your family! 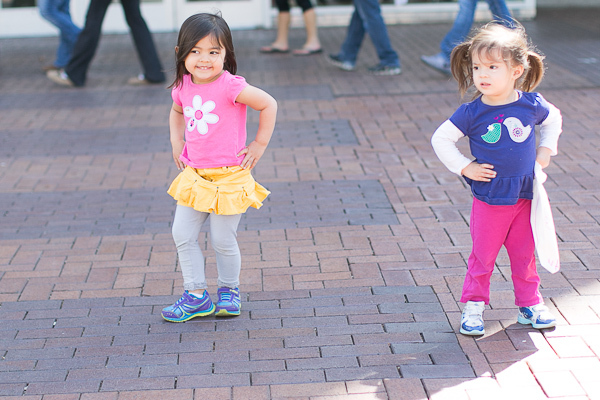 It might be best not to let your kids dress themselves like I did. 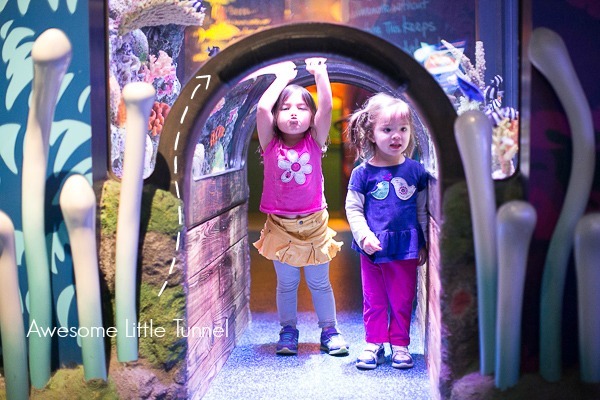 For more ideas on fun things to do with your kids in Kansas City, visit my Pinterest board. 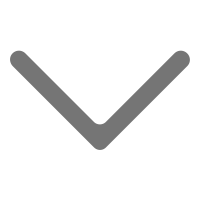 Don’t forget to Pin the image below. Follow me on other social media outlets for other reviews on Kansas City activities for kids: Subscribe, follow me on Bloglovin, Facebook, Twitter, Instagram & pin with me on Pinterest!